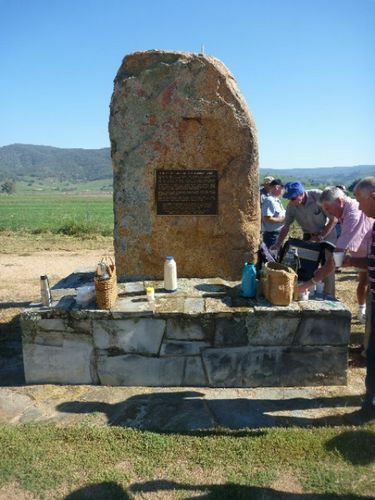 The monument commemorates the birthplace of the Murray Grey breed of cattle. THE BIRTHPLACE OF THE MURRAY GREY. Australia's beef cattle breed, the Murray Grey, originated here in the Upper Murray Valley`s Thologolong District. The first grey calves were born at the Sutherland family`s Thologolong property in the early years of the 20th Century. Murray Greys are renowed as easy care versatile cattle producing choice quality beef for a variety of markets and discerning consumers. "This breed by accident was nature`s, which in turn is God`s gift to our land Australia. These are our own cattle, our heritage, Australia`s heritage in the beef cattle world, and none can say agin (sic) this." Helen Sutherland, Founder Of The Murray Greys.